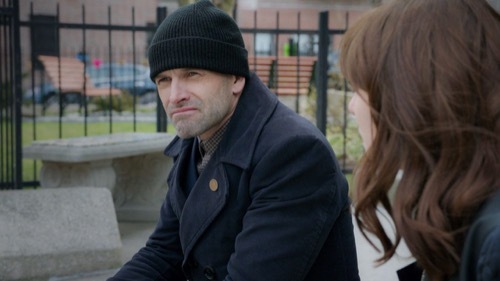 Tonight’s Sunday May 14 Elementary recap begins now: Sherlock and Watson meet with the chief at Shinwell’s house to discuss his death. Watson is angry and tells Sherlock that they have to bring down the gang, SBK. They want to bring down the whole gang not just the person responsible for Shinwell’s death. They know who the leader is but he is a professional. The police have been watching him for years but can never make anything stick. Sherlock decides to go to Bonzi’s brother for clues on how to bring him down. Sherlock goes to a 12-step meeting to help him deal with the death of Shinwell. He starts to have doubts about a recent case in which the man arrested killed himself. Sherlock is afraid he is losing it. Watson and Marcus interview Bonzi’s brother but he is of no help. Watson reviews Bonzi’s social media account and thinks he uses it to communicate with his gang. Bonzi calls the police and asks that they come to meet with him. He thinks he knows something about Shinwell’s death. Watson and Sherlock meet with Bonzi and he gives them the name of the man who killed Shinwell. Watson tells him that even if what he says is true she is still going to do whatever it takes to bring him down. He tells them to leave. The name pans out but the man won’t flip on Bonzi. While the team was in Ponzi’s house Sherlock noticed he had a special type writer that he thinks is used to code and decode messages. Watson stays up all night and is able to decode Ponzi’s messages but he changes it up before he can be caught doing anything illegal. It is another dead end. Watson and Sherlock continue to analysis the messages and think they have proof of at least four hits ordered by the gang. They also find a connection that leads back to Bonzi’s brother. The team interviews him again but he denies any wrong doing. They think the brother is actual the mastermind who is calling all the shots. They go to bring Bonzi in for questioning but he is unconscious due to a possible drug overdose. Bonzi is brain dead and his brother makes a threat towards Watson and Marcus. Sherlock meets with a woman from his 12 step group who is obviously obsessed with him. She also makes a threat towards him and says people who love each doesn’t make threats, they make promises.